Compatible with the net attachment system Accrofil. Making inaccessible flat roofs safe with these railings is a legal obligation. A tested and approved system. Thousands of references in France and abroad. This system allows a unique solution for each case which is really easy to install on-site. 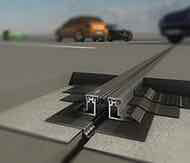 All the different models of guardrail (straight, right-angled, curved, folding) are part of the same system. The combination of the differents fixing modes (inside parapet wall, top of parapet wall, façada, roof slab, steel decking) allows the adaptation for more complexed construction site. 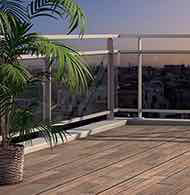 The finish (untreated aluminium or lacquered RAL Danilac) of Barrial can be adapted to the aesthetics of your building. If you want a freestanding system, check out our Premium and our Standard freestanding Barrial range. Barrial is compatible with our Z shoe of the Couvernet range. 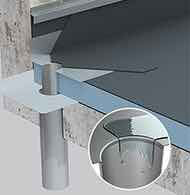 Metal coping range suitable to the protection against leaking for all kinds of walls, sealed or not. dani alu helps you with every step of your project. The stationary straight post is suitable for most cases. Z shoes support 60 x 22 mm posts, other shoes (A60, BA, D, M) 45 x 22 mm posts. Curving (radius 1000) or angling ( 15 °, 30 °, 45 °, other possibilities on request) enhance the discretion and the aesthetic of the guardrails on your building. It keeps the user away from the edge of the flat roof. If the edge of the roof is on the constructible limit, curved or angled models are more suitable in constructible size. The number and the spacing of clamps for rails are designed by our assessment department depending on the measurement of the parapet wall and on the type of shoe. Posts are customed made. Clamps and caps are installed in our factory. When aesthetic or environmental obligations do not allow visble stationary guardrails, this model is a compromise between architectural requirement and safety necessity. Handrails (45 mm or 35 mm depending on configurations) and rails (Ø 35 mm) are discreet and geared towards the terrace's interior. The standard length is 3000 mm. Handrails and rails are joined together with the junction piece, ensuring a safe and aesthetic continuity between the components. 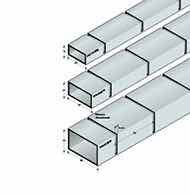 Oncorners, rails are linked by angle pieces with variable degree in order to suit every configuration. Wall fixing pieces and end plugs ensure the finish on ends. The clamp was designed to simplify the installation of the Barrial system and to allow an easy adjustment of the rail's height after installation if required. The use of clamps ensures easy installation of the rails. The use of the dani alu wrench (hex wrench n°4) guarantees a quick and safe clamping. The fixing screw stays accessible after installatio to allow the height of the rail to be altered without having to uninstall them. Accrofil is a safety net attachment system for roofers, designed specifically for Barrial permanent safety railings. 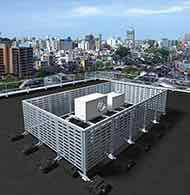 the permanent safety of inaccessible flat roofs or roof-top plant rooms. Using accrofil attachments, the net acts as a temporary infill to the gaps between the rails of the railing whilst works are being carried out, both preventing items from falling and improving personal safety on the roof. Accrofil is recommended for use where Barrial is fixed to a parapet wall, with straight, angled, or curved posts. The Barrial gate is custom made for a perfect integration on Barrial systems, including those with curved or angled posts. The width of the way is 800 mm for the standard version, but can also go from 500 to 1000 mm on request. The gate must be installed so that it opens towards the terrace's interior. 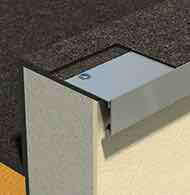 The A60 shoe is installed to the inside of a parapet wall. 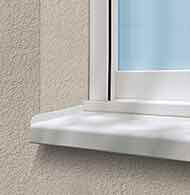 An extension of up to 60 mm is allowed in relation to the wall. It can also be used on façade. 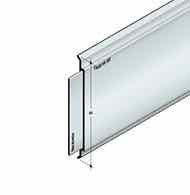 It is compatible with the use of a Couvernet aluminium coping. 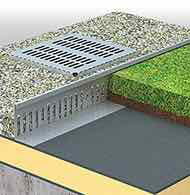 The A60 shoe is the simplest and most economical method of fixing if the parapet wall is high enough. The cut-our in the A60e shoe can be fitted by sliding it under the coping, if the parapet wall is not high and has a coping. A5 shoe is the solution when the wall doesn't have a coping. In case of shorter walls, the A60 shoe can be delivered with a recess. With the A60e shoe (with recess), the inside rim of the Couvernet is 40 mm, for every type of support. It acts as a fixing to the top of the parapet wall, thus avoiding the need to pierce the roofing upstand or flashing. 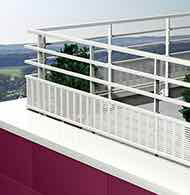 With its two fixings parallel to the plane of the safety railing, M shoe can be used on the narrowest parapet walls. If there is no possibility of fixing to a parapet wall, D shoe provides a fixing to the roof slab through roof finishes of various thicknesses. The various aluminium base plates, precoated with bituminous primer create improved roof finish. The base plate is protected by a thermoplastic collar that fits the diameter of the tube precisely and has a groove to take a strip of polyurethane mastic (in accordance with DTU 20.12). If there is no perimeter parapet wall, or if the height of the existing parapet wall is less than 150 mm, a skirting is be provided. The system delivered custom made, with all its fixings, joint elements and internal and external angle fittings. Aluminium base plates allow the connection to the waterproofing, the reconstruction of the upstand as well as the vapour barrier connection. BA shoe is compatible with steel panel roof coverings in accordance with French DTU 40.35. The panels and the supporting structure must be sized to take the loads as specified in standard NF E85-015. The plates are fixed to the tops of the ribs. The product can be used with the ribs in either direction. Where an insulated and waterproofed steel panel is on the outside, the aluminium sleeve plates will improve the apperance in accordance with good practice. Needed for a waterproofing complex higher than 70 mm. It is used to connect a self-finished roof finish on insulation to a metal sleeve, in accordance with the article 8.7.1.1 of DTU 43.1. Sufficient for a waterproofing complex smaller than 70 mm. It is used to connect a waterproofing complex, as well as the connection of the vapour barrier. 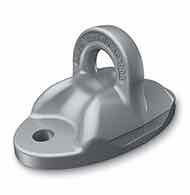 It thus forms the reinforcing bracket required by article 6.3 of French standard specification DTU 43.1. At its top, the base plate is protected by a thermoplastic collar that fits the diameter of the tube preciselyand has a groove to take a strip of polyurethane mastic. If there is no perimeter parapet wall, or if the height of the existing parapet wall is less than 100 mm, a skirting will have to be provided. The system is delivered custom made, with all its assembly pieces and its junction pieces. 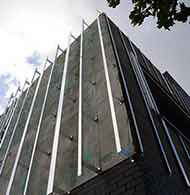 One result of the changes to the thermal regulations is the increasing trend to insulate parapet walls. Zd and Zc shoes are adapted for the installation of guardrails on insulated parapet walls. 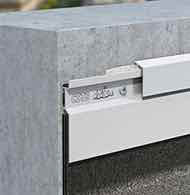 A EWIS Couvernet coping with plates or thermal break console (th) has to be put on top of them. The Z shoe's extension allows movement within the shoe to move the shoe inside the parapet wall made of a spoiler or inside the insulation up to 200 mm. The piece allowing this move is predimension in factory in accordance with the parapet wall specifications (height of the spoiler or width of the insulator). 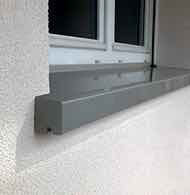 The fixing console for insulated parapet wall can be adapted to the Z shoe with stationary post. It allows to compensate insulations with width from 60 to 150 mm. The height and the offset are pre-adjusted in factory, in accordance with the specifications of the insulation given. The system also has a connection plate for the waterproofing. 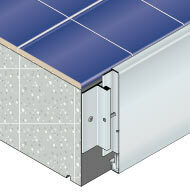 Z shoes are completed with a EWIS Couvernet type aluminium coping, with plate or thermal break console (th). The safety of inaccessible flat roofs by perimeter guardrails is a legal obligation. A tested and approved system. Thousands of references in France and worldwide. In cases where aesthetic or environmental requirements (classified sites, etc) are opposed to the presence of visible stationary railings, this model provides a compromise between architectural preferences and safety obligations. A folding version is available for most of the Barrial shoes. A unique production of the shoes, posts and rails allows upper part of the guardrail to fold towards the inside of the flat roof in order to make it invisible. Each folding module comprises at least two posts. The folding rails are delivered custom-made, depending of the modules indicated on the layout plan (max. length : 3000 mm) and with sliding internal junction pieces. 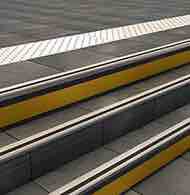 On ends and in the angles, a vertical connection allows the handrail to link with the intermediary rail. This is fitted with an internal sliding joint. The folding rails are supplied purpose-made to the modules indicated on the layout plan. 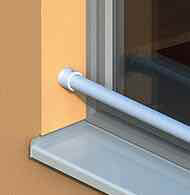 Allows up to 60mm movement betweenthe installation of the post from the wall. It can also be used on façade. 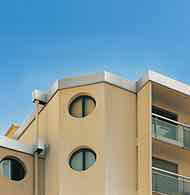 It is compatible with the implementation of a Couvertine aluminium coping. It is only compatible with straight posts. 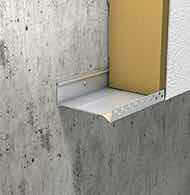 In case of walls of small heights with a coping, the A60er shoe can be installed by sliding below the coping. It is only compatible with straight post. A5r shoe is the solution when the wall doesn't have a coping. Zr shoe is compatible with most flat roofs, where parapet wall heights are usually not enough to be installed inside of the parapet wall. It attached at the top of the parapet wall, avoiding piercing the waterproofing on the upstand. Concrete support minimum width : 120 mm. Support max. slope : 5°. Please contact us if the walls have smaller dimensions or bigger slopes. Zr shoe is compatible with the implementation of a Couvernet aluminium coping type with heightened supports. Compatible with straight post only. When the parapet wall has no posibility of permanent fixing, the Dr shoe can be installed on the slab with a waterproofing complex (width up to 150 mm). For thicker complex, please contact us. The various aluminium base plates pre-coated with cold coating allows the connection of the waterproofing. is used to connect a self-finished roof finish on insulation to a metal sleeve, in accordance with article 8.7.1.1 of DTU 43.1.
is used if the roof finish is protected with chipping. 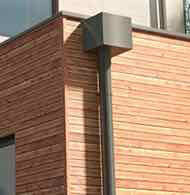 is used to make good a roof finish and its vapour barrier, without insulation. It thus forms the reinforcing bracket required by article 6.3 of French standard specification DTU 43.1. When there is no perimeter parapet wall or when the height of the existing parapet wall is lower than 100 mm, a skirting must be installed. The Mr shoe is the solution for most cases for flat roof, where the height of parapet walls are usually not enough to be installed inside the parapet wall. It is installed at the top of the parapet wall, thus avoiding a piercing of the waterproofing on the upstand. Support maximum slope : 5°. If your walls have lower dimensions or bigger slopes, please contact us !